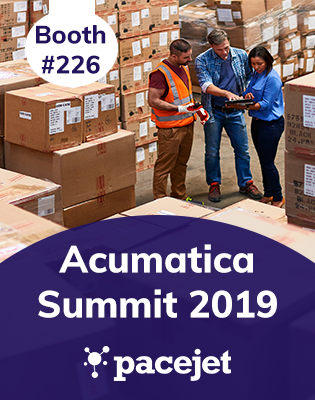 Pacejet gives Acumatica customers the most complete cloud-based system for parcel and freight shipping. We work with Fusion WMS and other leading systems customers depend on. When businesses choose Pacejet shipping software, they know they will get the right shipments to the right places more quickly, easily, and cost effectively than ever before. Our network includes almost every major parcel, freight, LTL and 3PL carrier – and customers can shop all of them from one screen. Our cloud-based omnichannel shipping software platform is designed to natively integrate with the ERP you use for everything else. That means no more time wasted scrambling between multiple ecommerce shipping sites. No more expensive mistakes resulting from departments and systems that can’t talk to each other. No more wondering what truly is the "best price." You can meet Bill Knapp, Steve Karem and Sam Bush from Pacejet at Booth 226 to learn more about how Pacejet helps shippers streamline their shipping process, increase efficiency and save money. Let us know you are interested in learning more or if you want to meet up during the Summit. We look forward to connecting!